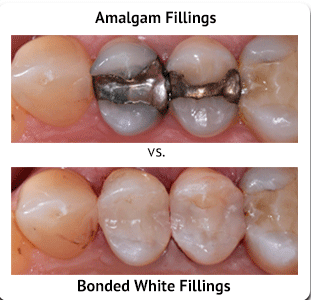 Many patients are familiar with the amalgam filling material of silver-mercury used by dental practices for many years. They work as a restoration but with some shortcomings. The metals do not bond tightly enough, allowing decay to set in. Patients are not happy with the appearance of a dark plug that contrasts with the color of their teeth. It is not aesthetically pleasing and can be very visible when talking or laughing. We do not use metal fillings at our practice, but offer modern composite resin fillings that bond very tightly to tooth structure to reduce the possibility of decay and also give added strength to the entire tooth. They can be made to match the shade of the natural tooth, making it invisible to create a pleasing smile. You may have heard of or seen ads for Philips Zoom Whitening. It has been featured in popular magazines like Rolling Stone and InStyle. In just one visit, we can change your tooth color to brilliant white. 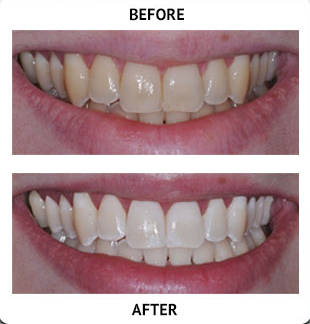 Another method that you complete at home is with use of custom-made whitening trays. We fit you for the trays and make them in our own lab, then give you instructions and enough supplies to complete the procedure at home. It is safe and very effective in producing the desired results in 1 - 14 days.